Blog Royal Wedding – Harry and Meghan’s Day! Join us as we celebrate the wedding of Harry and Meghan!! May 19, 11am-2pm – Royal Wedding Fundraiser Celebrate Harry and Meghan’s Day at the Museum: Classic British Car Show, picnic lunch – bring your own or order ahead (before 5/16/18), make your own fascinator, cutting of the wedding cake and games on the lawn. 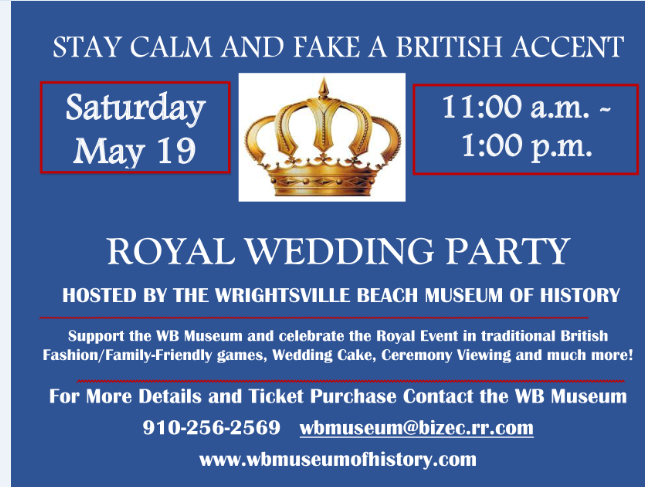 Tickets available at the door or at:https://squareup.com/store/wrightsville-beach-museum/item/royal-wedding-ticket. A fascinator or a tiara? Which are you? Make a fascinator on the museum porch, or bring your own tiara from home. Admission: $10.00 adults, $5.00 children under 12. Admission includes ticket books for 5 activities. Additional activity tickets available. 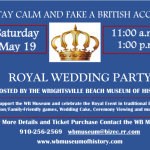 Tickets available at the door or at: https://squareup.com/store/wrightsville-beach-museum/item/royal-wedding-ticket. Must order a picnic lunch before 5/16 – 910-256-2569 or wbmuseum@bizec.rr.com. Please bring your family and friends to be a part of our day celebrating all things British!!! . Must order a picnic lunch before 5/16 – 910-256-2569 or wbmuseum@bizec.rr.com.